I’ve been thinking a lot lately about how Knowledge is changing in the digital age. With all the amazing resources, tools, connections, community information, mediums, people -it really all comes down to access, information and data. The World Wide Web has allowed us to access people, places and community – and how we are handling the abundant sources of information and data – which is changing how we are thinking and learning. I wonder how this is changing how we are learning literacy itself? Information is constantly being reconstructed and reshaped – in real time through combinations of mediums and perspectives and links and ideas. Our knowledge is being accessed, shared, given by anyone – adults to children and children to adults. I was given a book to read by my thesis supervisor a couple of months ago and to be honest, I left it sitting on my desk because I wasn’t sure how relevant the information would be with a publishing date of 2003. But, I couldn’t resist to read a few chapters and ultimately got pulled all the way in. Lankshear, C., & Knobel, M. (2003). New literacies: changing knowledge and classroom learning. Buckingham [England: Open University Press. While these authors discuss a variety of perspectives, (historically and culturally) about the development of literacy in education, what resonated most for me is their discussion that “schools (today) operate on the belief that knowing, thinking, believing are located within the individual, and that knowledge is seen in the final analysis as a private possession and is examined, and accredited accordingly”. Here they ask, “Have schools operated to regulate scarcity of credentialed achievement – including allocations of literacy, ‘success’?”. It was this idea that began their critical reflection and journey of what literacy really is today. Does the demonstration of individual knowledge, on the spot, tell our true level of literacy for each individual? Is literacy for an individual carrying out on something that already exists? Today, knowledge and information are accessed, shared, discussed, reshaped, redesigned, edited, re-edited, co-edited and so on, in public spaces -in collaborative spaces – spaces where questions and inquiry are encouraged. Yet, even so, these authors remind us that “knowledge is seen in the final analysis as private”, based on a mindset that was developed long ago. Eight years ago, even before Facebook and Twitter, these authors were questioning how we define knowledge and literacy in the digital age and how we are constructing and organizing our schools as a result. I am left uneasy with the thought that still, even with all the research, books, articles, blogs, and discussions that tell us our society is now depending on a problem-solver generation that can work collaboratively and seek out ideas globally -is evaluated on individual performance and often without access to tools such as networks and people. Unless it is individually demonstrated, is it cheating? It really is in the mindset. When will the mindset change I wonder. Blogs, Wikis and Podcasts, and Other Powerful Web Tools for Classrooms, by Will Richardson. Merriam-Webster dictionary choice the word “Weblog” as its “Word of the Year for 2004”, and the bloggers were ABC News’ “People of the Year”. Last year I went to a conference in London, Ontario and saw Will Richardson speak on the topic of Blogs, Wikis, and Podcasts as they relate to education. The gist of his presentation was two fold – first, to challenge and motivate teachers to think differently about their classrooms and second, to talk about the technologies in terms of pedagogy and curriculum. It is the second that intrigued me to buy his book because I strongly believe that our educational pedagogy is going through significant changes as we endeavor to meet the needs of 21st Century learners. In his book, Blogs, Wikis and Podcasts, and Other Powerful Web Tools for Classrooms (2006), he strongly advocates that educators should understand the implications that technology has for their classrooms and while he maintains that that we “have a long way to go” that it is essential that every educator do whatever he or she can to insure every student gets connect to the 2.0 Web ideas as quickly as they can”. Richardson explains that since 1989, we have all experienced a tremendous growth with Internet use and what he calls the “Read/Write Web” with ease and accessibility. I can personally remember when my parents got their first “internet” computer. I was in college at the time and my friends and I would visit my parents regularly to check out this “new” Internet. We would wait 5-10 minutes for pages to load to the intended links but we didn’t care because we felt a sense of freedom of being “in the know”. I remember finding my first map on Google, or my first email to my grandmother who lives 15 hours away. Today, about 15 years later things have changed so much. I now Video Conference with my grandmother through the use of webcams, use Skype to access long distance phone calls and I access my student assignments using my Blackberry. There is Internet in every school and soon, every classroom. Most households have Internet capability with some replacing their phone service, or TV with their Internet computer. According to Richardson, At the beginning of 2006, Technorati.com, one of many blog tracking services, listed almost 25 million blogs (short for Weblogs), the first widely adopted and easy publishing tool of the Read/Write Web, which people use to create personal journals of their lives, build resource sites with colleagues, or filter the news of the day for audiences large and small with no need to know how to code pages of transfer files. When Richardson wrote his book in 2007, in fact, the service was adding 70,000 new blogs and a million Weblog posts each day. As educators, the change has not been fully accessed and is at arms reach, but the tools of technology are here right now. In other words, education has been slow to adapt to these new tools and potentials. About 5 years ago, I was working at a small school in the East End of Hamilton. I remember asking the principal at the time about investing in network wiring for the classrooms so that every classroom could have at least one computer each with the internet. I thought the principal was going to fall over laughing. Only 5 years later, that same school is not only equipped with internet and computers in every classroom, but also has a Smartboard in 3 of the classrooms as well as a mini lab of laptops which can be accessed from room to room. The Internet has opened up the WORLD for the students (and teachers)…. Having access to the Internet as a teaching tool as totally changed the way I access and provide information to my students. “The ability to easily publish text, pictures, and video is changing the face of journalism” says Richardson. In June 2004, when the Tsunami hit South Asia, or the devastating Hurricane Katrina that hit New Orleans, every event – “within minutes was photogramed or blogged throughout the ‘blogosphere’.” (Richardson, 2006). Being able to show my students pictures and videos almost immediately makes the learning so much more authentic and as a result – engaging. This year, we accessed the Internet regularly to find information about the Federal Election, both US and Canadian. If there was a debate we could watch it, if there was a speech – we could watch it or listen to it. No waiting and for free. Now we have access to a program called DISCOVERY EDUCATION…access to thousands (literally) of video’s, pictures and more, without worries of copyright. According to Richardson, and without surprise, schools have been “slower to consider the potentials of the Read/Write Web in the classroom to date”. • What needs to change about our curriculum when our students have the ability to reach audiences far beyond our classroom walls? • What changes must we make in our teaching as it becomes easier to bring primary sources to our students? • How to we need to rethink our ideas of literacy when we must prepare our students to become not only readers and writers, but editors and collaborators as well? • How to we balance the safety of the child with the benefits that come with students taking ownership of the work they publish online. -it isn’t a perfect world he says “ and certainly there will be times when our students identities are compromised or that they will act inappropriately in front of an online audience. BUT…through his research, anecdotes from other teachers as well as personal experience, the overall student populations does not usually abuse the tools, and that “teachable moments” rarely become something more than just that. Richardson talks about online safety as more than just “publishing children’s names and pictures on the Internet of permitting students to access obscene content online”. He insists “Safety is about responsibility, appropriateness and common sense”. It is our obligation as educators to teach them what is acceptable and what is not. He reminds us that just like everything in life, using the Web carries some risks and that most other things, those risks can be reduced by having the appropriate information in hand by planning. He reminds us that the cases of Internet predators, while widely reported and are heart-wrenching in nature, the actual numbers of Web-related abductions or seductions are extremely small. How to keep kids safe on the Internet? 1) Interact with the Web – just like we teach children safety rules in the “real world” we now need to teach them online safety. We need to talk to students about how responsible use of the computer means not just refraining from actively seeking out inappropriate sites, but also reacting appropriately when they were happened upon. Schools and libraries are now required by the Child Internet Protection Act, to filter content that is accessible via the Internet. But even with the elimination of millions of sites from student access, there are still a majority of inappropriate sites that students can access – so being complacent about this issue is not an option – even with safety nets in place. • get parent permission before publishing any students information of picture on line. • Discuss with the students what should and should not be published online. Will Richards talks thoroughly about how the Read/Write Web tools can be used in our classroom. To be honest, it was hard to just keep reading the book because I wanted to start working on some of the tools. There are so many possibilities that are quick and easy and do not need much expertise. 1) Weblogs: According to Richardson, Weblogs are the most widely adopted tool of the Read/Write Web so far. Blogs are easily created, easily updateable Websites that allow an author (or several) to publish instantly to the Internet from any Internet connection. In my classroom we use weblogs for sharing student work and responding to one another using an online community format. Using a Weblog, students often publish their work to the internet which has created a higher sense of commitment for completing higher level work. If they know that the work is going to be read by others, their motivation to complete it well increases tremendously. 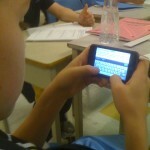 This is the first year that I have been using Weblogs in the classroom. It has honestly been an incredible experience reading the comments that the students are giving to one another about their work. This is a collaborative Webspace where anyone can add content and anyone can edit content that has already been published. According to Richardson, In schools, teachers and students have begun using password protected wikis to create their own textbooks and resource pages. Using a Wiki for my school website is my next MISSION. I plan to incorporate a Wiki into the website, thus, allowing several people to post, and update as needed. 3) Rich Site Summary (RSS): RSS is a technology that allows educators to subsribe to “feeds” of the content that is created on the Internet, whether it’s written in a Weblog or ina more traditional space such as newspapers or magazines. 4) Online Photo Galleries: Publishing digital photos to the Web not only means sharing pictures with family and friends, according to Richardson, “It also means becoming a part of a community of photographers sharing ideas and experiences”. This is a wonderful features to allow teachers to take pictures of student work and create a Digital Portfolio of the classroom for parents to see (sharing your bulleting boards). There are many more Webtools described by Will Richardson in his book and that is why I would recommend that YOU read it! Will Richardson sums up the book by talking about The Big Shifts. In this, he gives specific ways that we must reexamine the way we think about content and curriculum and the important shifts in how to best teach students. First he talks about the fact that we as teachers and schools must shift away from the thought that we “own” the content that we teach in the classroom. Instead it is more and more the collaboration between the student and teacher and the open-source-type of classrooms that we must grasp. Second, Richards talks about the amazing resources that teachers have, specifically – other teachers. He says, as our access to content increases, so does our access to other teachers. He also gives examples of how we are shifting to a collaborative construction of meaningful knowledge and that teaching is more a conversation that a lecture. He talks about the Web as a notebook and that it renders so many mediums of print that we can easily share with audiences of peers, students and mentors. Overall, this book helps educators to think differently about how technology can strengthen students critical thinking skills, writing, and interactive learning. Richards does not ignore the potential dangers that children (or adults) can face when using these tools but he does weigh these risks agains the immense benefits of this tool. Sharing Away! Cross-Post and let the learning be transparent! Why Not? When it is time to drop your lesson and talk about world events…. Just starting a Makerspace in your school? Tips on where to start!